Finally read this at Bloomberg. This thing must have been sanctioned at least at the highest level in Keppel i.e, its board and likely beyond to Temasek Holdings isn't it? In most places it would have stopped at the board because you can't go higher but here in SG for the stakes involved, the risk to Singapore's reputation and being mostly owned by Temasek, I wouldn't be surprised Temasek's management also knew and decided to risk it. Observing where this seems to be stopping, it is not going to go high enough. The lawyer who confessed and cooperated becomes the scapegoat and correctly decided to threw his lot with the prosecutors. 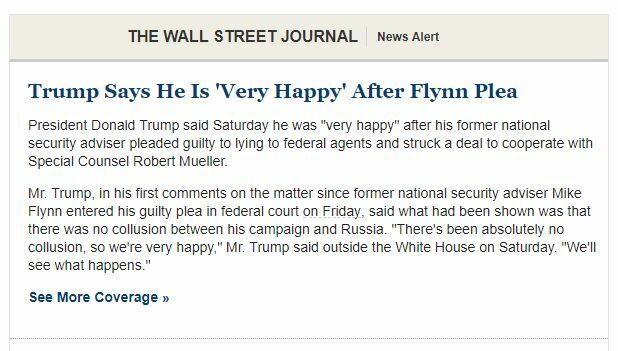 More important if the US did not have a law for going after such malfeasance Singapore Inc., would not also have been caught. Shame on us. Sometimes I wonder if this country has not already began to rot at its core because it is beginning to at the head. The legal side of things may be complete and costing S422 million but the moral debt which is necessary to prevent this from repeating has not begun and may never. So the lesson seems to me is to come up with better ways not to get caught the next time. What is Singapore's core value and god: MONEY. The quality of leadership in Singapore continue to worsen. That is Meiji milk, an increasingly popular brand among our consumers. I was comparing their regular type with its hi-lo cousin. I think it is wiser to give up the more popular hi-lo one for the original because of the 7g/100ml sugar. Lots of food manufacturers hide fructose in their products. We are all unaware that there is too much sugar getting into our systems. I think at the end of the day the simplest and most practical approach to food is not to over eat. If you cannot get the balance right choose to be hungry more often than full most of the time. We didn't put up our Christmas Tree last year. Nobody was in a mood too after Trump got elected US president. That mood has lasted a whole year and there is no tree this year too. 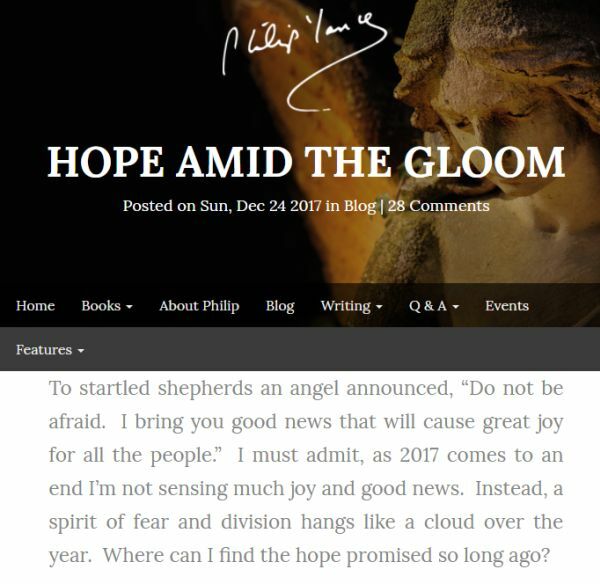 This morning I came across Philip Yancey's article and decided to make this post. He went on to describe what the environment was like when Jesus was born. Well we never despair we just persevere until things get better. Being in SG, there is not much we can do except resist and wear out the opposition because taken over long enough time, history is not on their side. Bought "Mei Qiu" ($12/kg) for dinner but it was too much and we kept one box for lunch the next day. After testing several types, I think we like D24 and this. The above cost us $44. Last season when the prices were sky high we bought nothing. What for? It doesn't take long for regular prices to return. Change the names and amounts but keep the items except for the bit about giving money to parents and replace that with health insurance, you would have thought it was American than Malaysian. These Malaysian millennials are financially structurally defeated. How long are they going to keep trying before they give up? They will lose hope and vote for the opposition. But the issues go well beyond endemic corruption in their society. America has successfully if inadvertently exported its economic logic there as well. In fact the pressure in business to act similarly with the Americans is all over the world. Wages aren't going up for most, lucky for you if it is not cut. Singapore feel the pressure as well but we are coping better but for how long I wonder. Daughter messaged us yesterday complaining that the non-smoking room they were assigned smelled bad. I asked her to look for the non-smoking sign and it turned out to be movable. 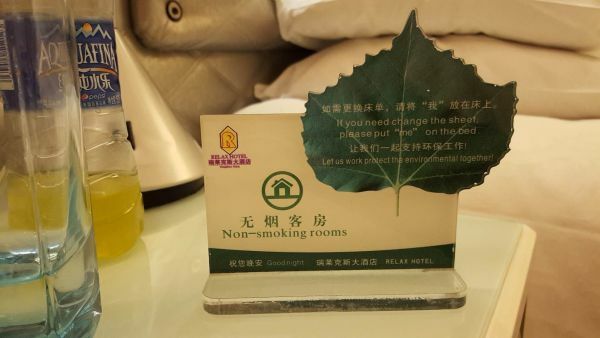 So you want a non-smoking room? Just take this with you and immediately a smoking room is turned into a non-smoking one. Well we don't decide on the hotel. This is decided by NUSRI in Suzhou. 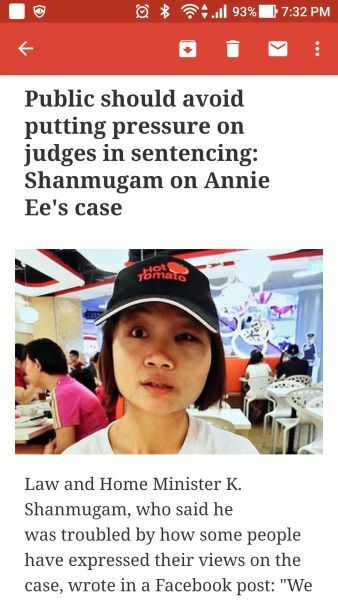 I think Shanmugam missed the point. People want to understand why there is a huge gap in the perception of fairness and justice between themselves and the judiciary. You cannot just ask the public to trust the system without explaining to them why this yawning gap exists, should exist and more important if we should close it. After all the law is not set in stone and can be changed. They have recently done it for drunk driving and for abuse of public security officers. Our ministers are more out of than in touch with us. 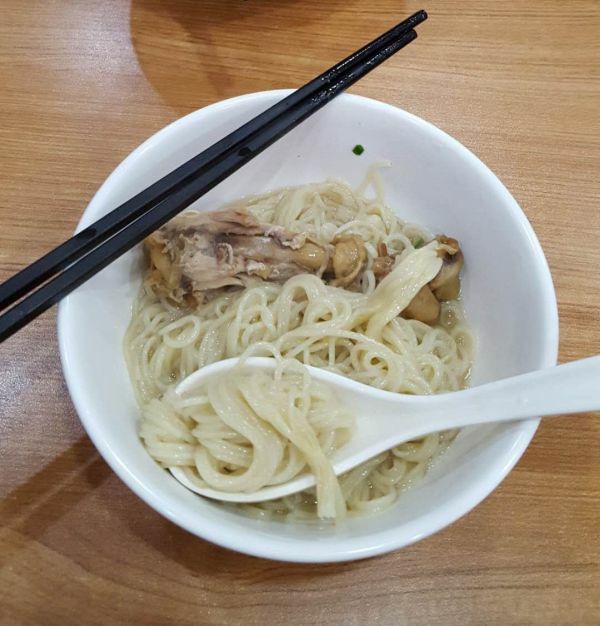 The daughter currently in Suzhou sent me this and told me she paid 5 rmb for this bowl of noodles. I don't know where the stall is exactly except that it is near 同得兴 which I recommended to them. Unfortunately that restaurant does not open for dinner and they found themselves another place near by. 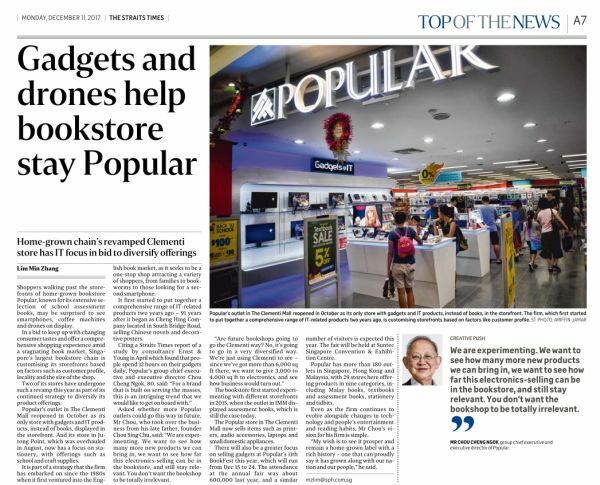 Chou Cheng Ngok the founder of Popular Holdings is one adaptable old man. He is already 80 years old but thought like a young man. Such types are rare. I hope he succeeds. He did the right thing to get the company off the stock market. Investors would not be patient with him. 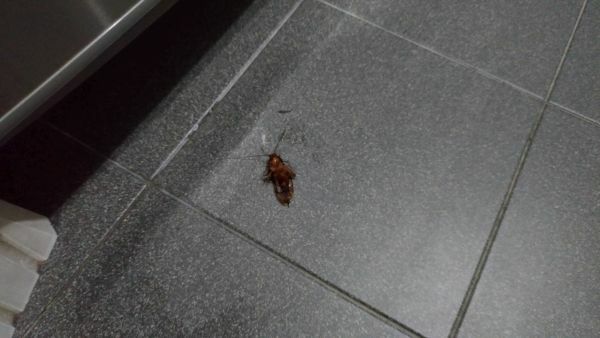 For a long time there were no more cockroaches to kill at home. Those were happy times. Now the peace has been rudely interrupted. We had three of these pests in four days. The latest one was in the kitchen and what a mess trying to get rid of it. The first two were easier to handle because they were in our study room. Unfortunately they were also flying ones. Number two flew in through the open window and that sort of helped us understand where they might all have come from. Now I wonder which and what is happening at my neighbours. I don't think roaches are long distance fliers. I think it is time to set up the roach trap as well. 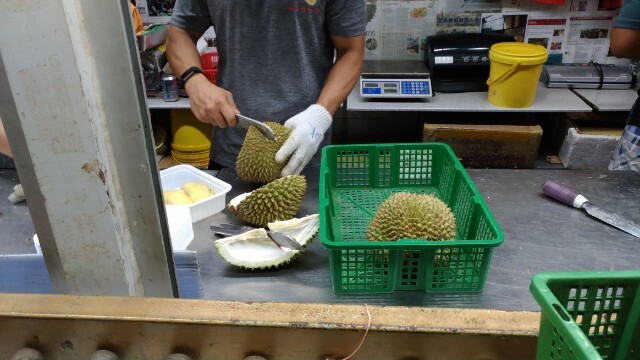 Finally we bought a couple of durians. We prefer D24 ($12/kg) but there was only one left, so we added a D13 as well. 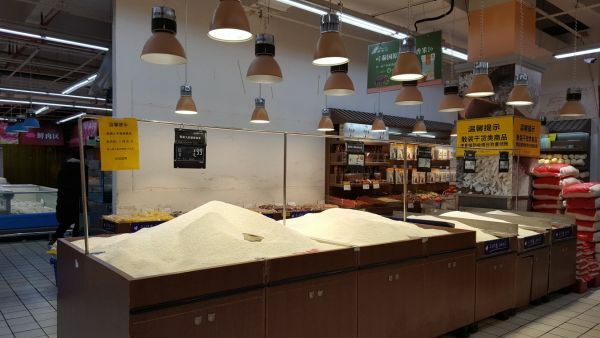 Personally I prefer Mao Shan Wang in desserts than as the fruit. It is just too strong. 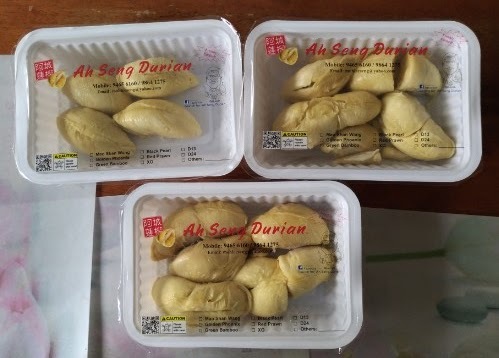 Something tells me I won't be having durians again for sometime. May be it was just a little too much yesterday? 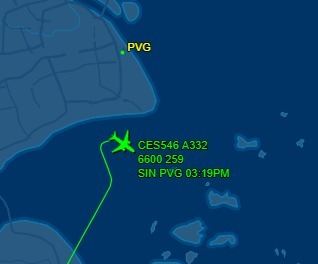 Watching the flight the daughter's was on arriving in Pudong yesterday. First time flying with China Eastern Airlines, which we made it a point to avoid despite their very competitive fares each time we flew to the US. In the end there are so many other more important things to chat with her about that we forgot to ask her about her flight. It was good she used the Singtel plan instead of a local one, that way we could still Whatsapp each other. When she is on WiFi, we use WeChat. Trump wasn't commenting for you and me or any thoughtful American voter. He is reaching out to his stupid base who are the extreme sufferers of the Dunning-Kruger effect. I am also watching how many Americans realize that the likely to pass tax reform would be bad for most of them. They have insulted themselves putting a lout in the White House, and I like to see next year if they add insult to their injury supporting the tax changes. If being dumb is a momentarily weakness, there is still hope for America as this happens to all societies from time to time. Otherwise it is the long predicted decline of America which seemed to be postponed again and again, all the way when Nixon delinked the USD from Gold.